Editor's NOTE-- For the very first time, a Han Chinese speaks out publicly in support of the ongoing Tibetan wave of self-immolations, and the writer, who is a prominent lawyer and civil rights activist writes about his journey to Tibet while visiting a family of a Tibetan self-immolator to pay his condolences, and solidarity expressions. Over the last three years, close to 100 Tibetan monks and laypeople have set themselves on fire; 30 people did so between Nov. 4 and Dec. 3. The Chinese government is seeking to halt this wave of self-immolations by detaining Tibetans it accuses of being instigators. Meanwhile, the scarless torture continues. I first visited China’s far west 21 years ago with college friends. Back then it at least looked peaceful, but now, sad news arrives daily. When I returned in October, a young monk invited me to visit his monastery. Passing a checkpoint where a red banner read, “Stability Maintenance Calls for Fast Response to Emergencies,” he told me how he hated the sight of armed soldiers. Because a road was closed for construction, I had to wait until evening to hitch a ride to Barma, where Nangdrol had lived, about 30 miles away. I was the third passenger in the car; the other two were young Tibetans. “Are you Buddhist followers?” I asked them. One of them showed me a pendant portrait of the Dalai Lama that he pulled out from his chest. “He is our true Holiness,” he said. “Have you heard about the self-immolations? Like, burning oneself?” I asked tentatively, finally broaching the topic. They knew about it. “Pardon me, but do you hate the Hans?” I asked them because Nangdrol had used the term “Han devils” in his suicide note. They’d heard about Nangdrol. When I told them I was there to visit Nangdrol’s parents to express my sadness, they told me more. They said they’d been to the site, as hundreds of Tibetans had. People had set up white tents at the intersection where he died. “He is our hero,” one said. It was dark when we arrived in Barma. At a lamppost, one of my fellow passengers asked a man for directions but was waved off. At a crossroads, he asked two men on motorcycles and an argument broke out. A monk came to the window to examine me. “Sorry,” my fellow passenger said, “they scolded me for taking you here.” A minivan approached. Two men jumped out of it and upbraided him indignantly. Fear and hostility shrouded the place like night. “We are Tibetans,” he said all of a sudden as we left Barma in silence to spend the night in a nearby town. “We are Buddhists, but we can’t go to Lhasa without a permit.” Years ago, you could see many Tibetans on their pilgrimage to Lhasa, but not anymore. The next day, I returned to Barma. I asked a young monk, on his way to fetch water, about Nangdrol. He took me to a hall where a middle-aged monk sat cross-legged in a corner. Since I didn’t have Nangdrol’s photo with me, he said he couldn’t help me. A teenage monk asked several of his peers but got no answers. Passers-by shook their heads. At a construction site, no one had heard about him either. In the town’s elementary school I asked an armed soldier guarding the gate. I’d read that Nangdrol was a student. The soldier suggested that I check out the nearby compound where a Chinese flag flew, but people told me the town had no secondary school. The road back from Barma was open only from noon to 1 p.m. I had to leave. Along a creek, a row of poplars basked in the golden sun, and a group of young monks in crimson robes were holding a class. Reluctantly, I climbed into a cab. I had been to many places over the years but never felt so lost. I stopped the driver a mile or so down the road when we passed by a village on a slope. After my repeated pleadings, the roadside shop owner gave me directions to Nangdrol’s home. Up on the slope, an old couple pointed to the house. It was a small mud-plastered house enclosed in mud-brick walls, and five tall sutra streamers flew on one side of the property. The iron gate was locked. A middle-aged woman with a boy, passing by, said she had known Nangdrol. His parents now live on a faraway cattle farm, she said. The day of his death, she told me, he wore new clothes, and he was freshly bathed, with a fresh haircut. He asked people whether he was handsome. I didn’t know how else to express my sorrow. I asked the woman to give 500 yuan (about $80) to Nangdrol’s parents, letting them know that a Han Chinese man had come to pay his respects. 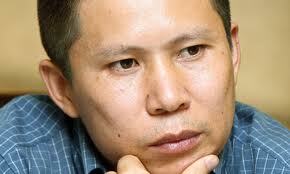 I am sorry we Han Chinese have been silent as Nangdrol and his fellow Tibetans are dying for freedom. We are victims ourselves, living in estrangement, infighting, hatred and destruction. We share this land. It’s our shared home, our shared responsibility, our shared dream — and it will be our shared deliverance. Loved this article. More Chinese citizens need to express how they really feel about self immolation. Cheers to this Chinese Citizen! I feel little cool from the rest of my heart burning for Tibet.